Dodge has launched a pumped up Hellcat. Ever since the Demon came along, it has overshadowed the lesser Hellcat. In a bid to keep the folks interested in it, Dodge has introduced the Challenger SRT Hellcat Widebody. Essentially, a Hellcat in Demon’s clothing. But, that’s not it. 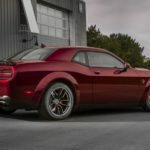 While the Hellcat Widebody may not have the 840 hp supercharged V8 from the Dodge Demon, under the skin, it does have a few modifications to differentiate it from the standard Hellcat. You still get the 707 hp supercharged V8 under the hood which can be more than a handful. Dodge has given it a new electronic power steering with custom modes. An improved cooling system ensures the engine doesn’t run out of puff sooner when driven flat out. On the outside, the Hellcat Widebody looks similar to the Demon albeit with minor details like the standard Hellcat hood scoop. The flared wheel arches and bumper extensions from the Demon and make the car 3.5 inch wider and a lot. These aero modifications have resulted in a quarter mile time of 10.9 sec- 0.3 sec faster than the Hellcat. Also, 0-60 mph comes up in 3.4 sec or 0.1 sec quicker than the standard model. The Hellcat Widebody also gets wider 11-inch wheels. The lightweight aluminium “Demon’s rim” is shod with Pirelli P-Zero performance tires for improved lateral grip. The Dodge Challenger SRT Hellcat Widebody goes on sale later this year at a starting price of $72,590.